Kyrie Irving scored team-high 21 points to go with six rebounds and four assists as the Celtics prevailed in Brooklyn to beat the Nets for the third time this season. 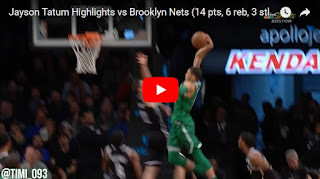 Jayson Tatum stole the show in the crunchtime and played some great all-around game, finishing with 14 points (including last five for the Celts), six rebounds, three steals and career-high six blocks! Marcus Smart added 11 points off the bench. Aron Baynes got the start alongside Marcus Morris with Al Horford being sidelined due to calf injury. Baynes got 10 points and six boards on the night, while his fellow big-man Daniel Theis posted eight points and 10 rebounds to go with two blocks. For the first time in his career, Theis got 10 boards in two consecutive games.